The LDS Media Library app—the mobile app version of the LDS Media Library on LDS.org—has been updated with easier searches, media trimming, customizable presentations, and offline use. 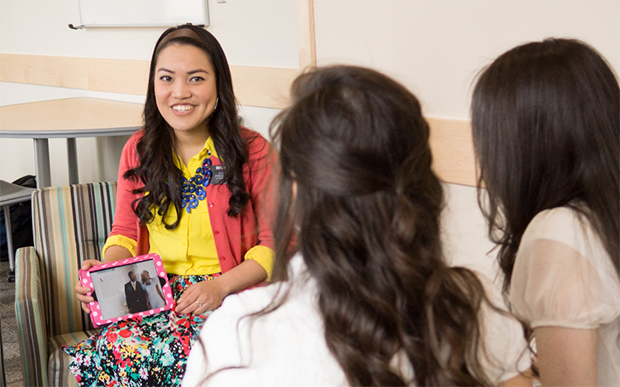 With the LDS Media Library app, you can search the largest selection of Church media, trim video and music, organize clips into a presentation, and then present without needing access to the internet. The Browse tab lets you explore media in three collections: images, music, and video. Tap one of the categories to see a list of topics and collections. You can also search by title, topic, or speaker. You can see images full screen while browsing. Browse often, since new media is added to the app every Friday. Under the My Media tab, you can create media presentations, sort and manage your downloaded media, and refer back to your favorites. When you download a single item, it will save in the Downloads tab. As you create a presentation, you can add media while searching or browsing, or go to the Downloads tabs, select the item you want, and tap Add to Presentation. You can trim short clips from conference talks or videos to show as part of a lesson. Just use the sliders to indicate the start and stop points. Everything you do automatically saves. You can then drag and drop clips in the order you want to present them. If you see a video you want to come back to later, just tap the heart icon by the media and it will save to a Favorites tab for future reference. Download your media at home and create a presentation with video clips ordered the way you want them. Then show the videos at church without needing to access the WiFi connection at the meetinghouse. 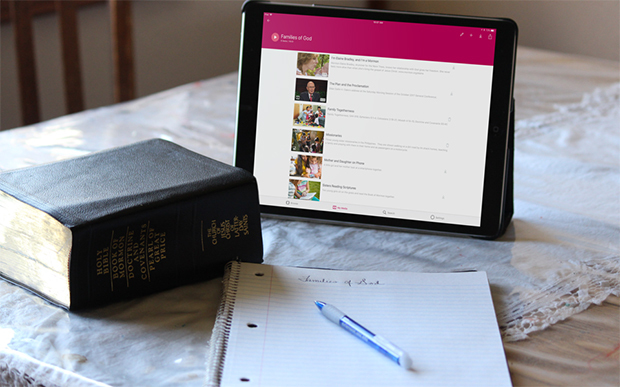 The LDS Media Library 2.0 offers media in English, Spanish, and Portuguese. Additional languages are planned for a future release. This 2.0 update offers media in smaller file sizes to save storage on your device. Also, once you create a presentation with video clips, you can delete the full-length videos to save space. Future updates to the app will provide the ability to view captions, add your own text slides, and add your own personal music, images, or videos. Go to Settings to submit feedback, read a user guide, and browse frequently asked questions. You can also download a two-sided PDF summary of the presentation that you can hand out to class members. Download the LDS Media App for Apple iOS or Android. 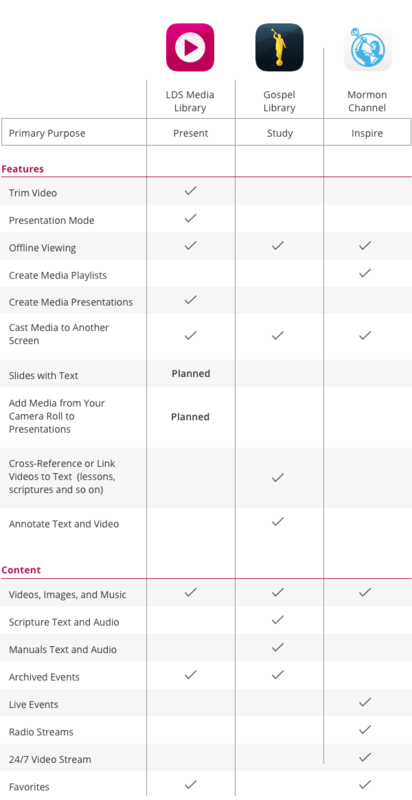 The following chart compares the functions of the LDS Media Library app, the Gospel Library app, and the Mormon Channel app. Can the presentation I created on my tablet show up on my phone?